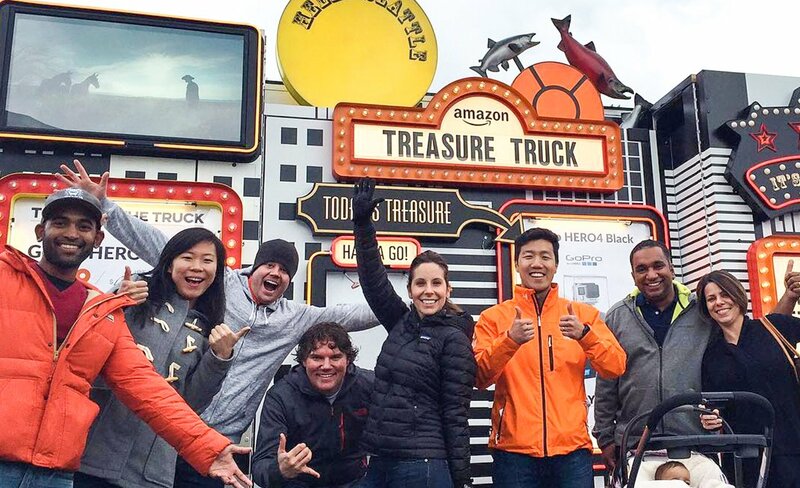 Amazon’s Treasure Truck is hitting the road in the U.K.
After slowly rolling out across the U.S. over the past two years, Amazon’s Treasure Truck is ready for a bit of international expansion. As with its Stateside introduction, the company’s taking baby steps toward bringing the deal-sporting vehicle to U.K. shores, kicking things off in London and Manchester. The company’s not really giving specifics about the timeframe here — that would ruin the element of surprise, I suppose. But I wouldn’t be too surprised if the Treasure Truck started driving on the opposite side of the road before the end of the year, in order to bring its randomized holiday cheer to U.K. streets. The Treasure Truck appears to have been a pretty successful experiment for the company, since it rolled out the first vehicles in early 2016. It’s a way to drum up excitement and extend its reach beyond the web without having to go all in with the (relative) permanence of a brick and mortar presence (though the company’s been experimenting with those, as well). The truck alerts users of its location via text message and offers up limited edition deals, that have included things like GoPro Cameras and NES Classics in the past. Amazon’s also customized some of the experiences for local markets, including a limited edition “Beast Mode” Amazon Echo, with ex-Seahawks running back Marshawn Lynch taking the wheel. After London and Manchester, Amazon promises the truck will be “tootling” into further U.K. cities soon.